Last Friday's PLAYgreen Festival promoted itself as the "largest eco-experiential college festival in the nation," and featured tabling from eco-conscious businesses from around the Bay Area and beyond displaying their green products and innovations. Hosted by the Recreational Sports Facility, the event was held in the Martin Luther King, Jr. Student Union and aimed to promote sustainability and eco-consciousness, according to the event website. The festival also featured an organic produce stand from Cal Dining, a display from Cal Adventures and a large number of vendor-driven freebies. "It's one of the nice events where ... green initiatives are coming together," said Kim LaPean, communications manager for University Health Services. LaPean was also tabling at the event as an affiliate of the "I Heart Tap Water" campaign - a movement focused on improving campus accessibility to and attitude toward tap water. 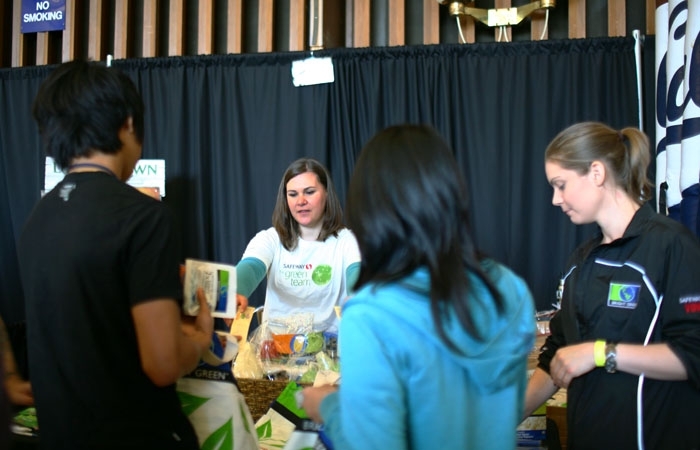 In addition to the "I Heart Tap Water" campaign, the festival featured booths from various student groups including the Berkeley Student Food Collective, The Green Initiative Fund, The UC Berkeley Office of Sustainability, and UC ROTC among others. LaPean said that there was a good mix of staff and students who attended the festival. Students who attended the festival said the event promoted sustainability in an entertaining manner. "I think a lot of it is making it fun for people and realizing that being green is pretty cool and pretty fun," said freshman Meredith Jacobson. Students at the festival could be seen sporting complimentary merchandise from various vendors, including metal water bottles from Bank of America, eco-friendly tote bags, Sabra hummus, Naked Juice and plastic sunglasses with neon green earpieces.